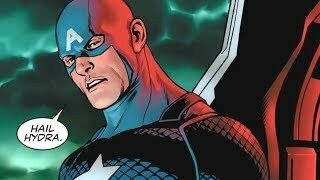 Heavily integrating historical events, writer Fred Van Lente is fleshing out a new origin story for the patriotic icon that leads fans into this new Marvel-cinematic-universe whilst still giving them enough connection with the existing comic-book history. Written by Fred Van Lente, Pencils by Luke Ross (Issues 1, 3 & 5), Neil Edwards (Issue 2), Javi Fernandez (Issue 4) and Andy Smith (Issue 6) Published by Marvel Comics.Issues 1-6 (of 8) available NOW in the Marvel Comics app for iPhone/iPad. Issues 1-3 (of 8) available NOW on Marvel Digital Comics Unlimited.Issues 1-4 (of 8) available in print. We all know that when a comic book is adapted for the screen there are going to be changes made. Hopefully these changes are to help contain decades worth of storytelling within 2 hours of screen time, such as in Bryan Singer's cinema-changing X-Men and Sam Raimi's true-to-form Spider-Man. Often times it goes horribly awry and comic aficionados lament the ruining of an artform. So with the coming of Disney/Marvel's next comic-book turned movie Captain America: The First Avenger we are all wondering what will the impending changes be? Well, lucky for us we don't have to wait until the film's release at the end of this month! Marvel in collaboration with the movie arm of the business have conscripted writer Fred Van Lente into the trenches of World War II to setup the world of the film. The series entitled Captain America: First Vengeance is being used to tout the Marvel Comic app on iPad and iPhone, being first available ONLY through the application. Later release is occurring for Marvel Digital Comics subscribers, and lastly to print for comic stores. Heavily integrating historical events, Van Lente is fleshing out a new origin story for the patriotic icon that leads fans into this new Marvel-cinematic-universe whilst still giving them enough connection with the existing comic-book history. The story is spread across 8 issues that are being gradually released each month. Each issue focuses on the backstory of the various characters, starting with Steve Rogers. The comic is presented in an often-used context, blending the immediate action-filled story with flashes from the character's past and memory. I have only managed to get my hands on the first 4 digital issues, so my review is currently somewhat limited. The first two issues cover territory that is very familiar for Cap or Avengers fans, dealing with the life before Steve Rogers undergoes the Super Soldier serum experiment. What diehard fans will discover instantly are the small yet important changes that the film has made; the foremost being the altered relationship between Cap and Bucky. Rather than the more traditional father/child relationship that the comic has ever erred to (including Mark Waid's female Bucky during the Heroes Reborn reboot), this new version introduces the pair as childhood best mates. I am personally battling over whether this is a good idea, but will have to wait until the film to make my final decision. I found issues 1 & 2 okay to read. There was little stand-out material and the art was good, but not eye-catching. Honestly I only kept reading as I knew that the film was around the corner. But I am glad that I did. Issue 3 is a whole different comic book. The story and characters are strong and striking. Luke Ross' art had me open-mouthed as I waited for each new panel full of emotion and narrative. The third issue takes you away from the hero-side of the story and dumps you unceremoniously into the midst of Hitler's Third Reich. Page 10 is one that I cannot get out of my mind. It simply yet powerfully depicts an horrific event in this new universe that has strong ties to our real-world history; I could not move on from such an affecting image. Issue 4 changes tack and looks at a pivotal decision in the life of Abraham Erskine, the scientist behind the Super Soldier serum. Here I found the artwork of Javi Fernandez strong and evocative, but the writing lacking the gut-punch that was delivered in the previous issue. I can appreciate how hard it would be to write a continuing story-arc whilst having to change character perspective every issue, however it seems as though Van Lente found a natural passion in devising the lead up to the Red Skull, but less so in other of the film's characters. As I still have 4 issues left to read before the film explodes onto the silver screen, it could be said that I should hold my verdict until the end. However, I am inclined to review Captain America: First Vengeance as a marketing ploy that has moments of tremendous merit. Van Lente and the shifting team of pencilers have a difficult task. To not cover ground that will appear in the film, and yet try to get the fans salivating in anticipation. Issue 3 was so strong that I have my fingers crossed for at least one more issue of this impact before the series reaches its apex at Issue 8.